Craft Brewed Chef | You will find good food and beer here! You will find good food and beer here! After a long search we chose a new style of system for Craft Brewers from a company called IDD. IDD is run by an English Ex-Pat Jeff Gunn, Jeff has been in the brewing industry since the early 70’s and designed a mash filter for use by Craft Brewers who like us, need throughput without masses of beer hanging around. Mash filters are nothing new, they have been around for years, but IDD is the first to take the machinery to a Craft Brewer size. Rather than the mash (the bit where your brewing sugars are made) resting in a lauter tun and then draining the sugars from the spent grain, the filter acts as a pneumatic press which drops the process time to less than a third. In all, the system should take our brewing from7 hours to about 4 hours and enable us to do multiple batches in a day without too much effort. We also get flexibility on batch size which is a real plus. Anyway, so jumping on a plane to see the equipment is a bit of relief. I have’nt slept for nearly a week with the anticipation. Combine that with a busy brew schedule over our contract plants, it has all been a bit over whelming. So, at this moment its hard not to be a bit reflective. Without the trust put in to me to make the company beer by Mark and Ronda I would not get to do what I do. And without the support of my very forgiving wife and family, then I would not be here. Looking forward to seeing the ‘Conviction Brewery’ (or Connie for short) in a few days, then getting her packed and on a boat. Beer and food, meant to be. lookout for lots of fun things to come up from Scotty and Paul! 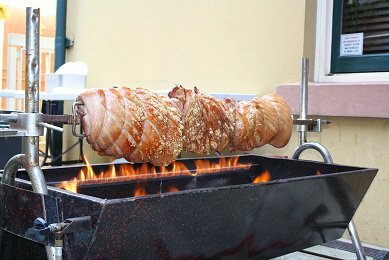 1 meter of pork - is that enough?